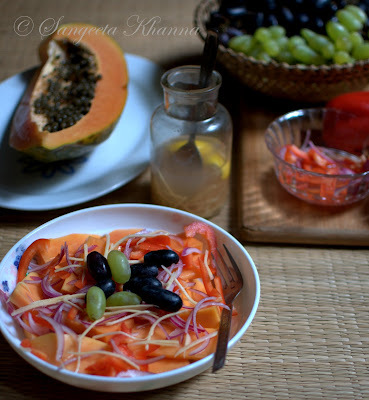 Papaya is a favorite food of beauty queens and models as it helps clear the skin. A nourishing fruit that helps in detox too. As we all know, skin is an indicator of our overall health as well so such fruits definitely help availability of nutrients by the system. Papaya is not only a very low calorie fruit, it contains soluble fiber and is packed with minerals (Calcium and Potassium apart form trace amounts of others) and Vitamins, mainly Vit-A and flavonoids (beta-carotene, zea-xanthin, crypto xanthin and lutein), all potent antioxidants. Vitamin- C is also packed in papaya. So it has all that keep the free radicals in check, improves gut flora and nourishes the mucous layer inside the gut wall. Yes, the Calcium and other minerals help to keep the collagen healthy. Keeping the gut flora healthy is a concern for most people who have been on medication and antibiotics for long, who have been on a fast foods and over processed foods for some time and also who eat protein rich foods but don't have enough vegetables along with it. 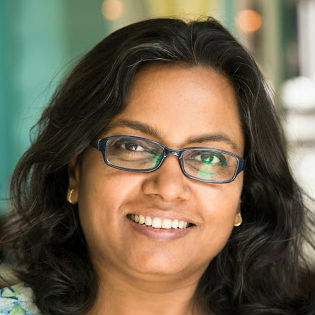 Also, most of us living in cities live a very sterilised life, not being closer to nature, gardens and plucking fruits off the trees and having them directly is unknown. We need a few friendly bacteria in our gut and having a few fruits that are prebiotic in nature helps reviving the gut flora. Banana and papaya are the most easily available and affordable such fruits. Onion and green chilies are also good prebiotic foods to consider for daily consumption, eaten raw, even in small amounts. A healthy gut would help absorb nutrients better, mobilise them better and if we get a good supply of antioxidants and Vitamins in our food, there is no reason the skin would not be good. Tossing up salads for better nutrient availability is the best way to supplement the system. We obviously need supplementation of a few nutrients if you are deficient, but nothing like a natural way to get everything we need. This salad has all the elements for a person who is fitness conscious. The addition of raw pickled onion and ginger helps fight inflammation caused due to heavy workouts and red bell peppers and papaya help in making the nutrients available. Apart from other benefits. 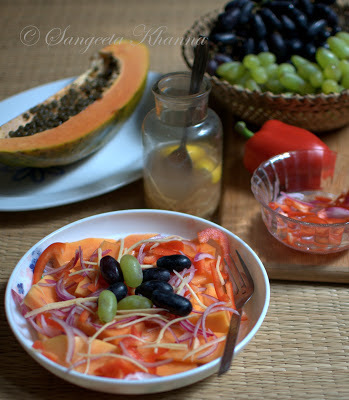 Also, papaya is not the best tasting fruit so tossing up a salad with some zing is a great idea so we enjoy it everyday. 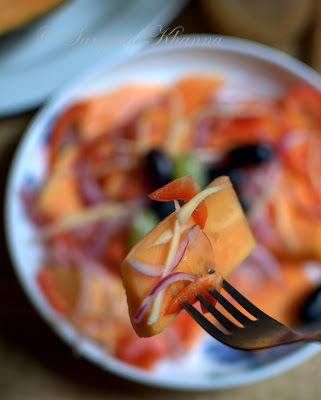 The onion and red bell pepper slices are first soaked in a tsp of vinegar (I used coconut vinegar, you can use any vinegar you like) and a pinch of pink salt and kept aside while you peel and slice the papaya. Ginger slivers can be mixed with lime juice and honey and kept in the fridge for everyday use in different salads. You can always mix them all freshly too. A tablespoon is required for this salad per serving. Just cut the papaya slices in bite size pieces and layer them in the base of the plate or bowl. Sprinkle the pickled onions and red bell peppers over the slices and then top with the lime juice and honey pickled ginger slivers as well. Serve immediately. No salt or seasoning is required over this, but you can sprinkle a little more pink salt if you wish. Few slices of pineapple added to this salad will be great if you can. I normally get a large papaya or a pineapple at once as we (the two of us) finish any of these large fruits in 2 days, so if we cut both a papaya and a pineapple together it will take 4 days to finish them both. They both keep well in fridge but it's always a better idea to finish them sooner. So they go one by one for us. 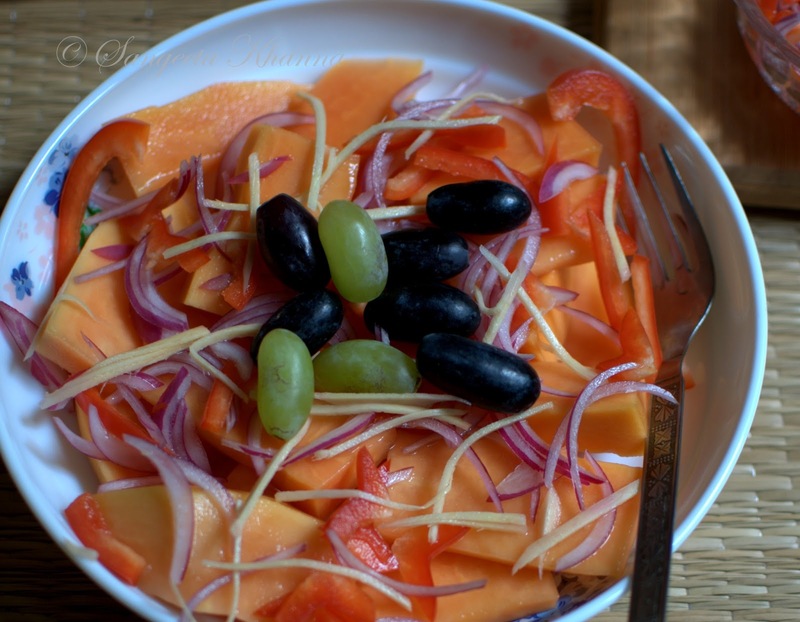 I have used a few grapes to this salad too as they also help in improving it's prebiotic and probiotic properties. It is always better to wash the grapes thoroughly when you buy and then keep them for a day so the bacteria on the surface have a chance to grow again. As we eat the grapes with skin, we eat the friendly bacteria too along with it. Just take care not to wash them thoroughly just before eating them. Same is true for the green chilies used in salads and raw salsa dishes. How is this bite of salad looking? You get a burst of flavors in every bite and nourish your system every day. It is a great detox salad as well, helps cleansing the gut naturally and effectively. 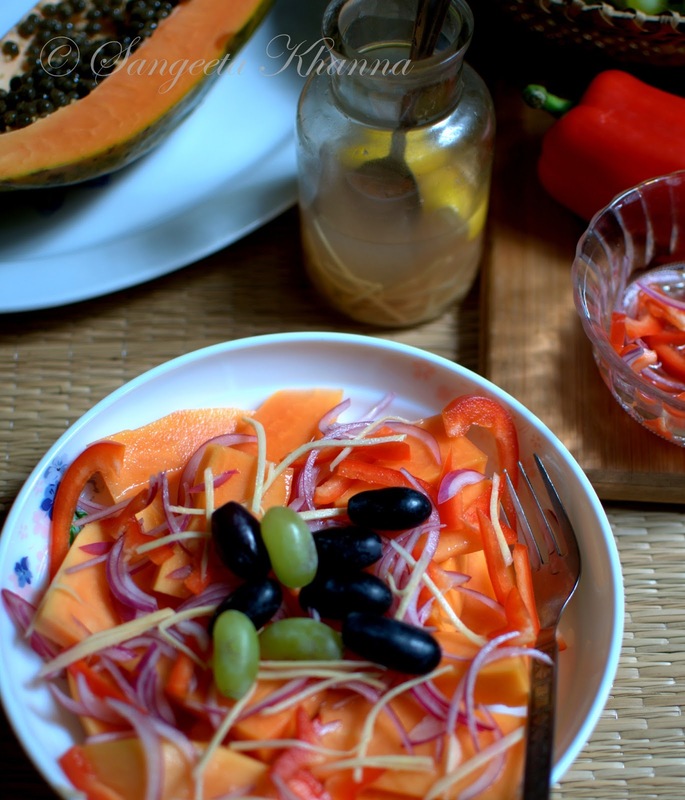 Papaya salad that helps in getting a good skin and more | improving gut flora..
we usually have papaya plain and sometimes with bananas. with the onions and ginger the salad would surely taste good. As wonderful and exotic as it looks I doubt I am eating that ! :P I hate papaya toooo much ! Pickled onions (instantly pickled) give a nice tang to the fruit. I like it this way, you might need some more of pink salt so adjust seasoning to your liking and I am sure it would be good for you. I think your blog hates my comments it always eats it up and hey I think your page also takes much longer than other blogs to load ! maybe you could check what is the reason ! I am so sorry Hitchy..I have been getting so many spam recently that sometimes the real ones get stuck in the process. BTW, I know what all you don't like, will make something suitable for you when we meet. Okay? I like it, very healthy..